COME AND VISIT US at the UAE Pavilion! 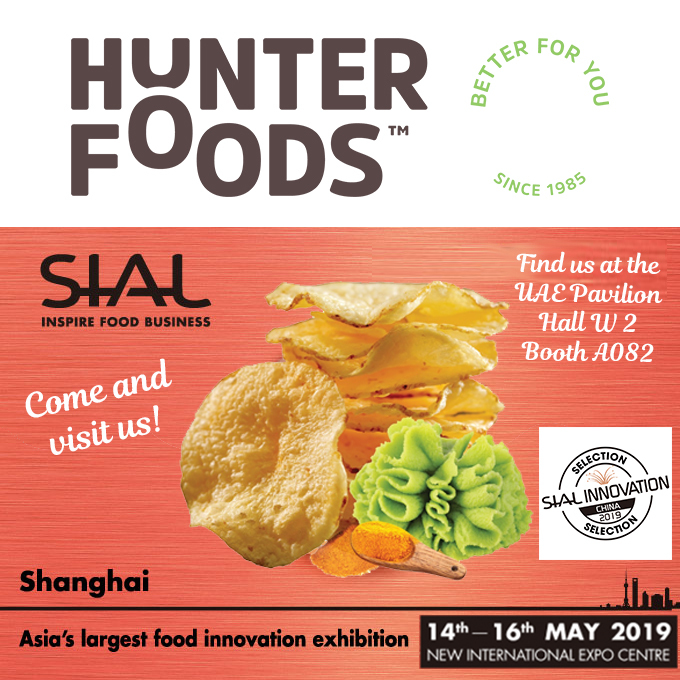 Hunter Foods will be exhibiting at SIAL China for the first time, from May 14th to 16th, 2019, at the UAE Pavilion, Hall W 2 Booth A082, in Shanghai New International Expo Centre (SNIEC). Hunter Foods is your one stop-shopping destination for all your healthier and Better for You foods and snacks. Established in 1985, Hunter Foods is a leading manufacturing company that provides the widest range of innovative and alternative Better for You snacks and foods. Located inside the Jebel Ali Free Zone, Dubai, it benefits tremendously from the proximity to the port and being in Dubai, the ideal geographical location to be the strategic gateway and export hub with strong links to the rest of the world. Hunter Foods supplies all the major retailers and HORECA in the UAE, and exports to more than 25 countries in the world, either under its own brands or Private Labels. “SIAL China is certainly one of the most prestigious and largest international marketplaces for food industry professionals seeking inspirations. It is a great and exciting opportunity for Hunter Foods to expand businesses across the world, especially to China.” says Mr. Ananya Narayan, Hunter Foods’ Managing Director. Sial China is Asia’s largest food innovation exhibition. This year more than 4 300 professional suppliers from 67 countries will gather to present valuable market insights, trends and innovations.